Using memory in your storage device to speed up your computer is another trick am going to teach you in this article, you can use space on USA flash drives and flash memory cards to increase the current speed of your computer. 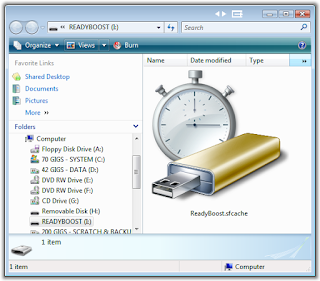 ReadyBoost can speed up your computer by using storage space on most USB flash drives and flash memory cards. 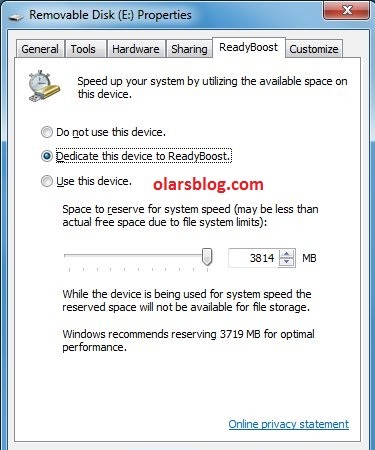 When you plug a ReadyBoost-compatible storage device into your computer, the AutoPlay dialog box offers you the option to speed up your PC using ReadyBoost. If you select this option, you can choose how much memory on the device to use for this purpose. 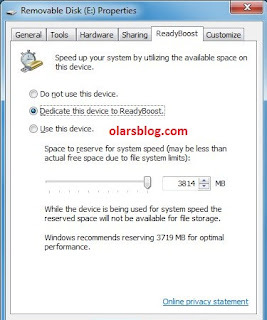 When you set up a device to work with ReadyBoost, Windows shows you how much space it recommends you allow it to use for optimal performance. For ReadyBoost to effectively speed up your computer, the flash drive or memory card should have at least 1 gigabyte (GB) of available space. If your device does not have enough available space for ReadyBoost, you'll see a message telling you to free some space on the device if you want to use it to speed up your system. The ReadyBoost tab lets you decide how much storage space on a removable device to use for boosting your system speed. The minimum amount of available space recommended for ReadyBoost to effectively speed up your computer is 1 GB. For best results, use a flash drive or flash memory card with available space of at least double the amount of memory (RAM) in your computer, and preferably four times as much memory. For example, if your computer has 1 GB of RAM and you plug in a 4 GB USB flash drive, set aside at least 2 GB on the flash drive to get the best performance gain from ReadyBoost, and preferably the entire 4 GB. How much memory you need depends on how you use your computer. Keeping a lot of programs open at once uses more memory. Give ReadyBoost 2 GB to 4 GB of space for best results on most computers. You can reserve more than 4 GB of space for ReadyBoost on most flash drives and flash memory cards. (Storage devices formatted with the older FAT32 file system can't store more than 4 GB.) You can use a maximum of 32 GB of available space on any single removable storage device with ReadyBoost and up to 256 GB total per computer (by inserting up to eight USB flash drives or flash memory cards into the same computer). To work with ReadyBoost, a USB flash drive must support USB 2.0 or higher. Your computer must have at least one free USB 2.0 port where you can plug in the flash drive. ReadyBoost works best if you plug the flash drive into a USB port directly on the computer, rather than into an external USB hub shared with other USB devices. If you want to be sure a USB flash drive works with ReadyBoost, look for a note from the manufacturer that the flash drive is "Enhanced for ReadyBoost." Not all manufacturers list this on their packaging. If there is no mention of ReadyBoost compatibility, the flash drive still may work with ReadyBoost. There are many different kinds of flash memory cards, such as CompactFlash and Secure Digital (SD) memory cards. Most memory cards work with ReadyBoost. Some SD memory cards don't work well with ReadyBoost due to issues with the SD card interface. ReadyBoost will display an error message if you attempt to use one of these cards. If your computer has a hard disk that uses solid-state drive (SSD) technology, you may not see an option to speed up your computer with ReadyBoost when you plug in a USB flash drive or flash memory card. This is because some SSD drives are so fast they're unlikely to benefit from ReadyBoost. In some situations, you might not be able to use all of the memory on your device to speed up your computer. For example, some flash memory devices contain both slow and fast flash memory, but ReadyBoost can only use fast flash memory to speed up your computer.